With a lovely day bringing in spring we had to cruise somewhere. Tilly was allowed out whilst we had breakfast, but came home on time so that we could make ready. Just as we dropped the clean pram hood a C&RT boat cruised past towards the lock. 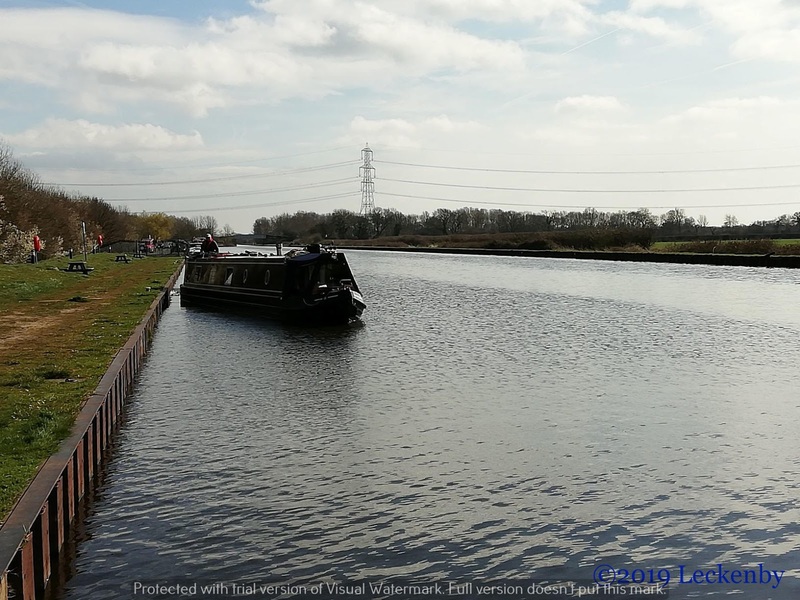 We were uncertain as to whether both boats would fit in the lock at once, I walked ahead and left Mick to bring Oleanna. The chap with the key of power waved us in as their big boat nudged up, plenty of room! 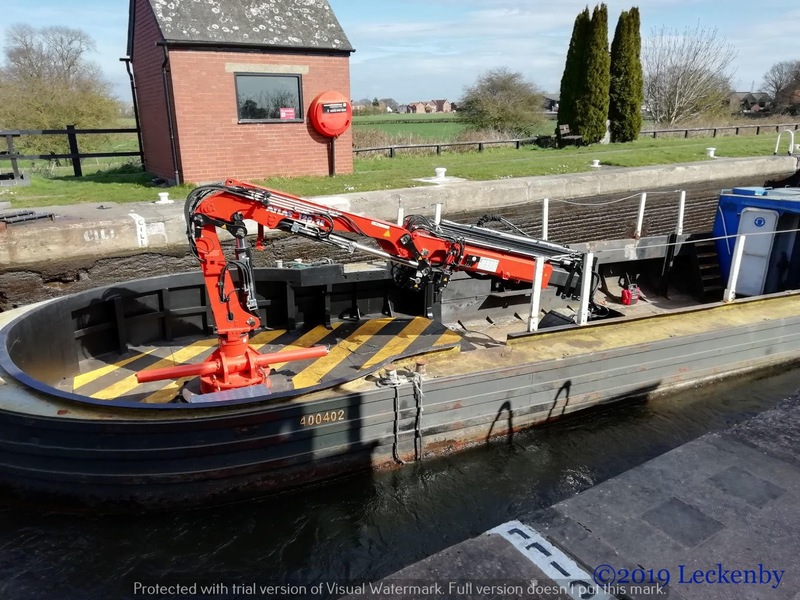 A shiny brand new crane had been fitted onto the boat, they had been to Goole to get it fitted and were now heading back to Heck where there is a big C&RT yard. Once up they pulled over and let us past. No coats required today, sun, sun, sun. Ahead of us Ferrybridge cooling towers, just to the right Eggborough and now just behind us Drax, the only one left generating. As we passed South Yorkshire Boat Club a 1970’s cruiser was pulling out and fell in line behind us. One of those with a sliding roof, perfect for a day like today. 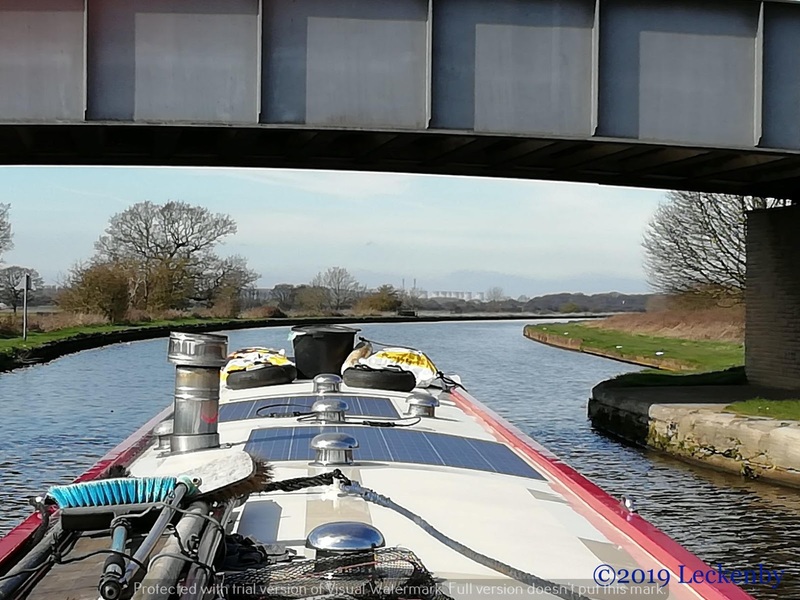 Approaching Whitley Lock we pulled in at the end of the visitor moorings, hoping that the noise from the M62 wouldn’t be too much. A low rumble in the background, it was acceptable. The doors opened and our little thug went off to explore, the steep sided drain covered in duck weed did give me slight cause for concern. But if she got in there she’d have a better chance of getting out by herself than with one of us trying to help! After lunch Mick walked up to the bins with a bit of rubbish, still plenty more which we’ll off load when we go through the lock tomorrow. Tilly had been gone just a little bit too long, so I had to do my mad cat woman calls. It took a while for me to get a response from her, but when I did I could see her on the other side of the drain! Well there were trees over there and tallish grasses which looked much better. No idea if she’d jumped across or if she’d found the footpath with it’s bridge. Making sure she knew about the bridge to get back I was a lot happier about the drain. Late morning C&RT notices had started to come through. 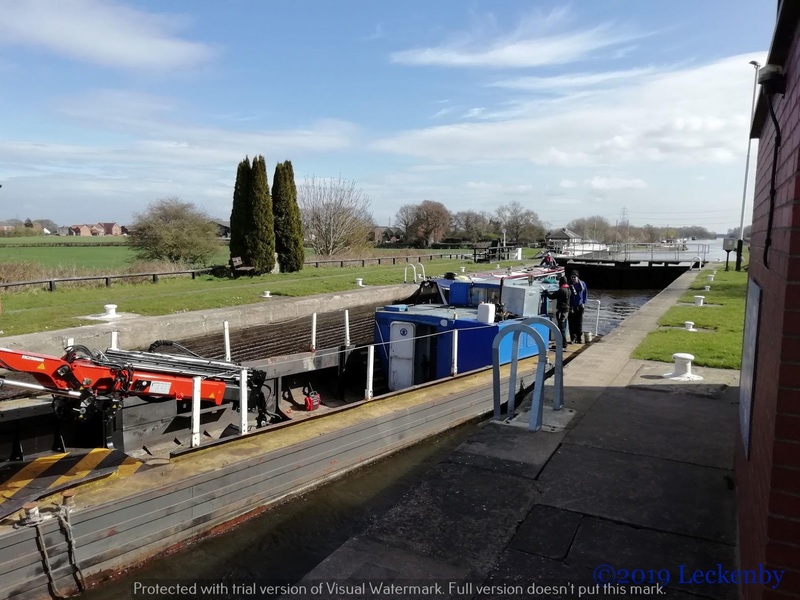 At 11:30 Thornes and Wakefield Flood locks had been opened and within another half hour the hole of the navigation was open again the levels now in Amber. Checking the webcam in York the pavement was visible again and a chap was busy spraying the silt back into the river to tidy things up for the tourists. By the evening people were sat out on chairs watching the river go by. Our summer chairs were dug out from under the bed as it was such a lovely afternoon. Mick pottered with the MPPT controller, he lengthened the time that the system is in absorption mode. 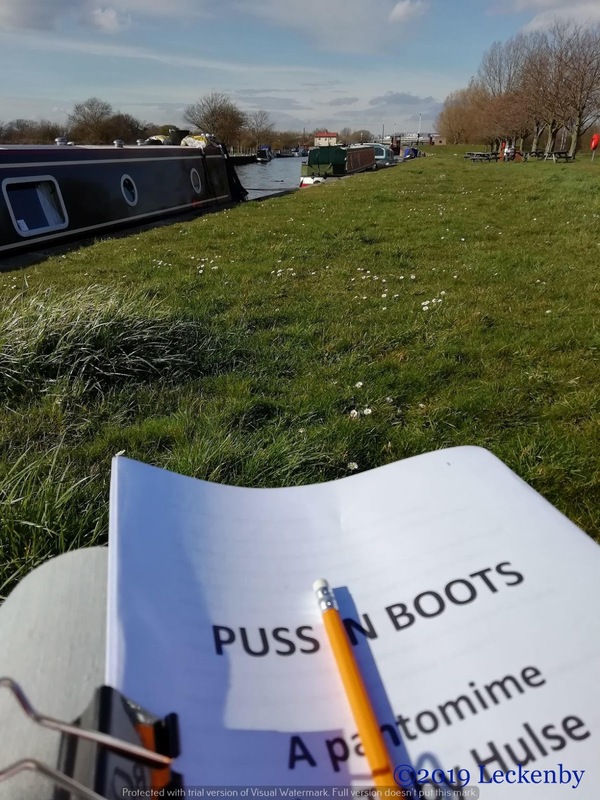 I sat out and read through the script for this years Chipping Norton panto, Puss In Boots. The sun must have shone so brightly out of my bum last year that I’ve been asked back. This year I’ll be absorbing myself in anything 1960’s East End. A very amusing read, the fisherman across the way kept giving me looks. Tilly also busied herself by bringing friends home. One was a playmate. Tilly was removed inside so that it could make it’s escape, but it seemed reluctant to. I offered to lend it a hand, but I must have been very scary as it decided to leap into the canal. Luckily there was a ledge, with the aid of Mick being more scary than me and a plant pot I managed to catch it and set it free in the friendly cover to dry off. Later on I brought home an aperitif, nice and crunchy, good for the insides. She wasn’t too keen on it, so I made sure I finished it all up. This evening we’ve been deciding which way to go. In past years when we’ve planned on heading south to the Kennet and Avon Canal, we’ve always ended up going north. We seem to be doing this again! Selby, York, Ripon? Over the top on the Rochdale? Decisions decisions decisions! 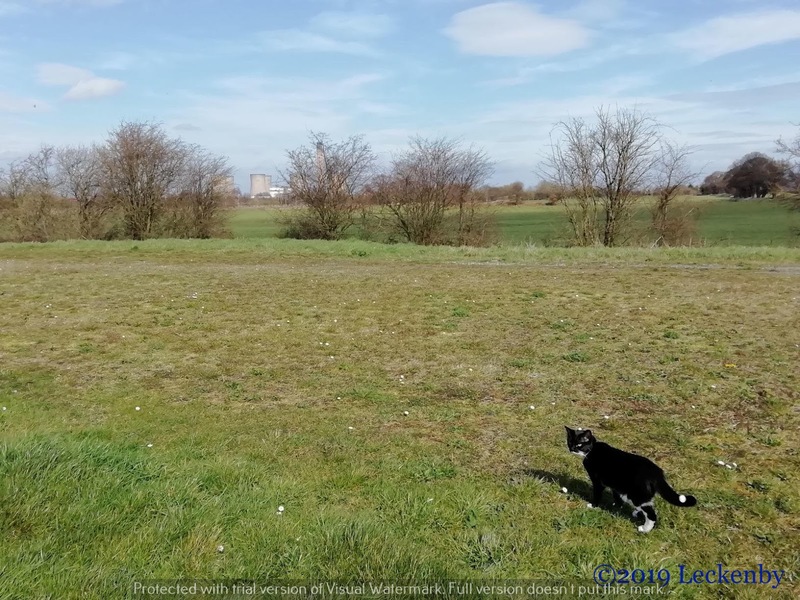 1 lock, 3.61 miles, 3 power stations, 1 east coast main line, 1 new crane, 1st day of Spring, 2 chairs, 1 script, 2 cats (puss and Tilly), 1 birdy, 1 aperitif, 1 playmate, 1 bridge, 1 game of stones, 1 pooh bucket on the roof, 1 river on amber, 1 fish crumble, 2 balls yarn wound, 1 Mrs Tilly stamp of approval. 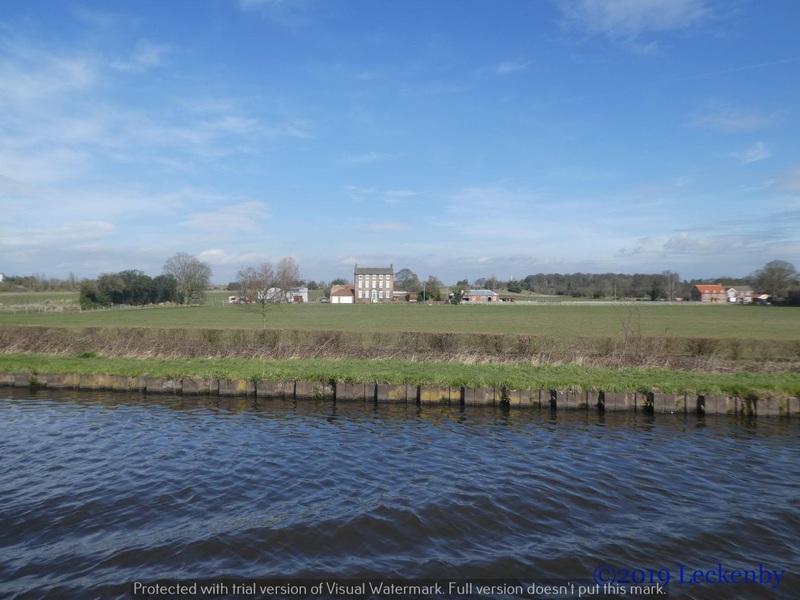 This entry was posted in Uncategorized on 22nd Mar 2019 by pipandmick.